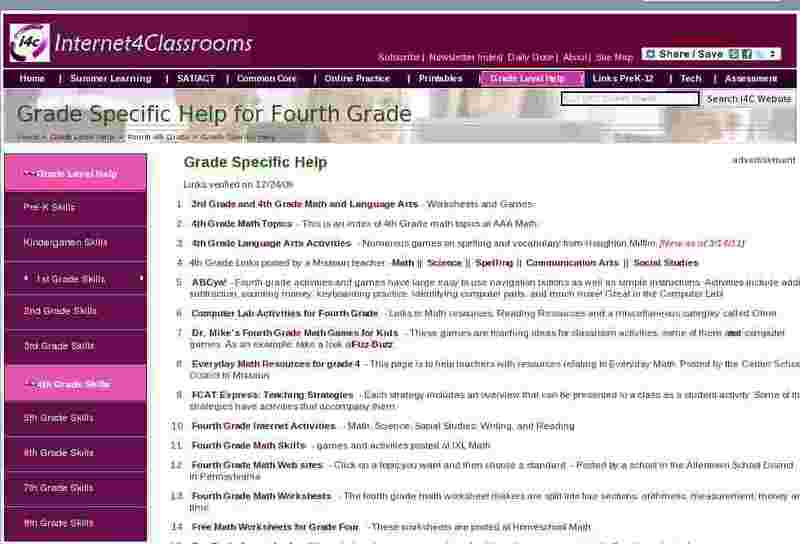 4th Grade Math Topics - This is an index of 4th Grade math topics at AAA Math. ABCya! - Fourth grade activities and games have large easy to use navigation buttons as well as simple instructions. Activities include addition, subtraction, counting money, keyboarding practice, identifying computer parts, and much more! Great in the Computer Lab! Computer Lab Activities for Fourth Grade - Links to Math resources, Reading Resources and a miscellaneous category called Other. Dr. Mike's Fourth Grade Math Games for Kids - These games are teaching ideas for classroom activities, some of them are not computer games. As an example, take a look at Fizz-Buzz. FCAT Express: Teaching Strategies - Each strategy includes an overview that can be presented to a class as a student activity. Some of the strategies have activities that accompany them. Fourth Grade Math Worksheets - The fourth grade math worksheet makers are split into four sections: arithmetic, measurement, money and time. Free Math Worksheets for Grade Four - These worksheets are posted at Homeschool Math. Fun School Games and Activities for 3rd and 4th Grade - This site has activity centers, math games, language games and puzzles. Toon University Math Games for 4th, 5th, and 6th Grade - Fourth grade, fifth grade & sixth grade activities can be launched by clicking on one of the five topics at this site. These activities are made available by ToonUniversity.com, where children are learning faster. Toon University Reading Comprehension and Spelling Games for 4th, 5th, and 6th Grade - Fourth grade, fifth grade & sixth grade child education activities (spelling games, reading comprehension, etc.) can be launched by clicking on a link at this site. These activities are made available by ToonUniversity.com, where children are learning faster.